Speedloaders are awkward things. They’re cylindrical and don’t fit comfortably into the pocket of your blue jeans. They may bounce around in a jacket pocket a little better, but they are still rattling around loose with the dust bunnies and credit card receipts. 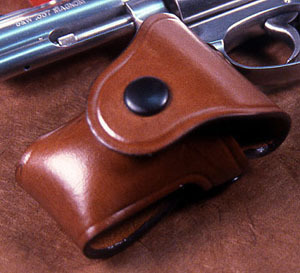 Back in the days when police officers carried mostly wheel guns, some duty belt speedloader carriers were developed which were built from heavy leather and attached to the belt, standing out from the belt a couple of inches. These were OK perhaps for duty gear, but they’re not really great for plainclothes or civilian use. 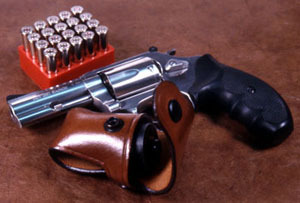 There may not be a completely non-awkward way to carry speedloaders, but if you’re going to carry a revolver, you know you need to carry a reload or two. (You do carry a reload, don’t you?) I have found one option that’s a bit less awkward than some of the other methods I have seen. The Bianchi Agent Slim Speedloader Pouch is a workable solution. The Agent pouch is attached to your belt by threading the belt through the pouch itself so that the cartridges actually straddle the belt and sit on top of it. This creates a half-and-half distribution of the thickness of the speedloader on the inside and the outside of your belt. The result is that the pouch rides close to your body and doesn’t stick out from your belt as far. The pouch doesn’t automatically scream, “Gun!” It just looks like one of the little utility pouches that people carry these days for personal electronics or hand tools. I conceal it nevertheless. I have been testing this pouch for several weeks and I find that it’s not as awkward and uncomfortable as I thought it might be. At $22 MSRP, the pouches are reasonably priced (I think I actually paid $17 each for the two I bought). There will probably never be a speedloader pouch that lies as flat and smooth against your side as a single-stack magazine and pouch, but the Agent is not considerably thicker than a double-stack magazine pouch. If you, as a conscientious wheel gunner, have been practicing your reload, (You have been practicing your reload, haven’t you? ), you know that you really need the speedloader to be quickly accessible to your right hand, and it really helps if the speedloader is in the same place every time. You don’t want to be fishing in your pocket during an emergency. You can position the Agent on your belt on the right side just forward of your gun, so that the speedloader is quickly accessible for a strong hand reload. The Bianchi Agent Slim Speedloader Pouch is a solution for the problem of carrying a reload for revolver packers. It’s a much quicker reload than a speed strip drop pouch.